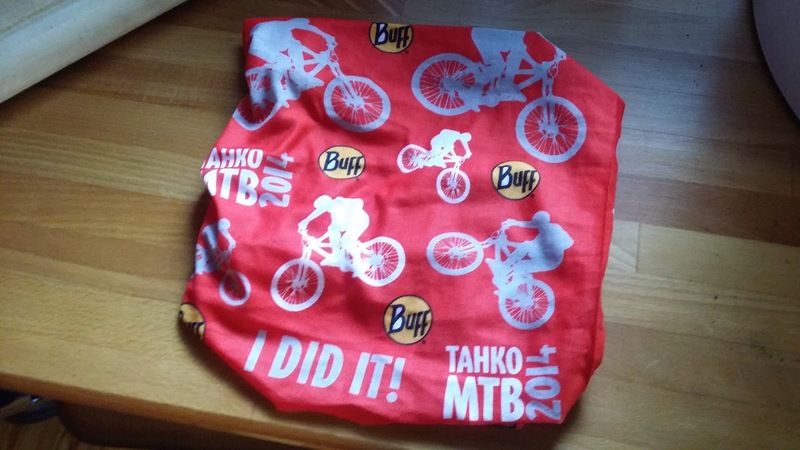 Tahko MTB. The Real Deal. The Final Frontier for Finnish mountain bikers. After the disappointment of last year's race, I really wanted to succeed this time. Succeeding here doesn't mean a good position in the results. I don't consider myself as a true mountain biker. I'm a snow biker, with a road background, and it's completely different ball game. Succeeding means here to get to the finish line without injuries, as I prepare and train for the biggest race of my life: Iditarod Trail Invitational. After last year's race, and well before this year's race, I had also one other goal in my mind. I don't really 'like' the race course of Tahko. Don't get me wrong. It's great. It's the toughest course in Finland, period. So, this meant that if I succeed, I will not come back to Tahko ever again. My form has been pretty good after Rovaniemi 150. Not as good as in R150, but I felt fairly confident that I really could finish Tahko this time. And things were looking good, because the weather forecast was absolutely perfect: no rain, night time temps +6...+8° and daytime max. about +16°C. Only one thing was unsure before the race: how wet or dry the course was, because June has been fairly rainy in some parts of Finland. Final preparations went well with MTB-Turku group at our cabin. 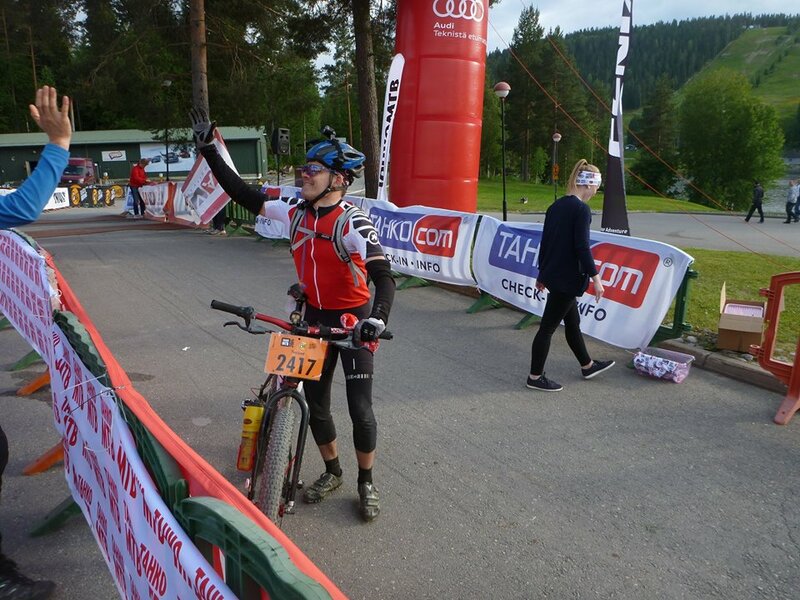 I felt good in the evening and was really looking forward to the start at 00.00. I decided to go fairly fast for the first lap, because I knew that as the race progressed, I would not be 'fast' after the 1st lap anyway. The true test begins at Kinahmi 1, a steep rocky climb, followed by rocky trail on top of it and a technical descent. I went really well, and I was even surprised how easy my riding felt on the rocky trail. Surly Knard 29x3.0 tires with Bontrager Duster rims, set up as tubeless, worked really great. Also, riding in the night without any traffic jams was awesome too. As a bonus, there were even bats flying with me. The race course was very dry and fast. It was clear that all records would be broken. Kinahmi 2: I felt great, and 'Stairway to Heaven', an ultra-steep pushing section, went well. After that it would be interesting because for me, it's difficult to find good rhythm and flow to Tuulivaara. Another surprise was followed. Riding felt again fairly good. Tuulivaara is the rockiest and craziest section, and I was slightly worried that I was too slow. My hands and arms were pretty beaten by the constant banging of the rocky descents and trails. El Grande: now, I said that I don't like the race course of Tahko, but this final big climb is actually something that I like very much. I rode it really well. Time for the first lap: 3h 51min 49sec! This was much better than I expected. This was my fastest lap in Tahko, and I rode very cautiously! I unplugged the batteries of my lights, ate, and continued. Although the first lap went so well, I couldn't think about the fourth lap. It felt already insane. Fairly soon in the second lap, a young fatbiker, Antti, caught me and we chatted for awhile. I couldn't ride as well as I wanted, because a call of nature was clearly needed and I took care of it just before Kinahmi 1. I was riding somewhat slower than in the first lap, but it felt like things were under control. The only thing that worried me was my arms and hands. All the descents felt awful. My lower back was giving also the first signs of pain. It's no wonder that majority of riders rides with full-suspension bikes. El Grande went fairly well again. Time after 2nd lap: 8h 30min 3sec, meaning that the 2nd lap took 4h 39min. I was well on my schedule. I refilled my hydration pack, ate properly and was really pumped for the third lap, because the mass start of 60 km and 120 km was behind me. The idea of doing all the damage to myself for the third time (and that 4th lap, what the hell?!) felt ridiculous. But I found it very important to not think too far ahead. I was thinking that just ride one lap and think after that what you can do next. It was the same thing inside the lap. It helped tremendously with the intermediate targets: Kinahmi 1, Kinahmi 2, Tuulivaara and El Grande. I was hoping to get on top of Kinahmi 1 before the fast guys, but the going was tough and they came just before it. I gave space to them many times as I stopped next to the narrow trails. It wasn't problem for me, I had plenty of time for this lap, and this is part of Tahko spirit. I started to feel tired too, but now I was entering my favourite part of endurance racing: the mind game. I started to give orders for my sore and tired body: "Don't give up". "Pain is temporary, quitting lasts forever". "My wife hurts more with her never ending back problems, this is nothing". "Think Alaska, you need this before it". And yes, those orders were working! The traffic jams were pretty much over after Kinahmi 2. Although my mind game was helping me, so were the other riders who were giving encouragement to me! Thanks guys! There was one shorter, steep climb that I had to push, but I was again able to ride El Grande from start to top. But man, I was hurting really bad. It wasn't only my arms and hands. Lower back was really bad, and pretty much the whole body was hammered. The third lap took 5h 3min, 13h 33min 28 sec for the first three laps. Although I felt awful, it was clear that I would go for the final fourth lap. I was wondering that how I could do that, but like with the other laps, I went for the intermediate targets. Peter and Jarkko came to the exchange area. They had DNFed as they figured out that they just didn't have enough time for the 3rd lap. They also gave encouragement and said that I could do it, no reason why not. And this was indeed the final lap. No need to punish myself anymore after this lap. Every difficult place that I passed would not come ahead of me again. The easy cruising before Kinahmi 1 didn't feel easy this time. I was hammered. I was tired. I was sleepy. Two slower 120 km riders came past me and I rode with them. We stopped at the first service point, and my plan was also to stop at every service point to eat, drink and slightly recover. Kinahmi 1. Pushing felt hard but after that I got a small burst of energy and was able to ride fairly well the rocky section and downhill to the next service point. There was also third rider with us, who decided to DNF at the 2nd service point because of broken front derailleur. After the service point I called my wife that I was in the final lap and I would ride to finish, no matter what. I was alone. Kinahmi 2 was really tough and slow, but I was in the mind game field. I kept saying to myself again: "Don't give up". "You have done it before, you can do it again". But it was really really hard. I was not only punishing myself. I was torturing myself. Tuulivaara was absolute hell. Every bodypart hurt like never before as I hammered through the insane rock formations. I was relieved after Tuulivaara but I was in serious pain. My lower back has never been so painful as it was now. I wanted to ride all the way to the top of El Grande. I took a short break, layed against the ground to give some relief for my back. It helped, just slightly. I was really gritting my teeth and gave all I got at El Grande. And yes, I rode it to the top! Amazing feeling, with all the pain I had in my body. Now it was only the descent to the finish. I was in euphoria, I was going to do it! 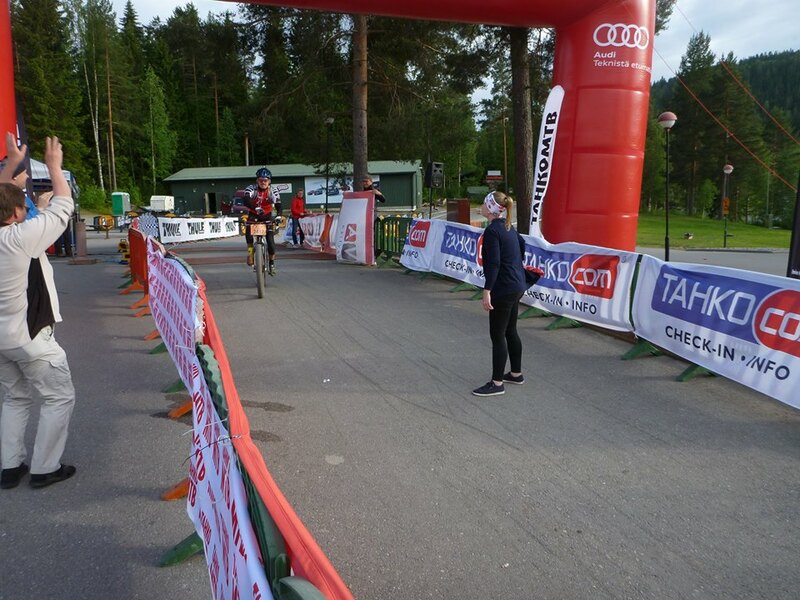 Matti, Peter, Jarkko, Aki (and maybe some others) and also Jarmo Järvinen and Antti Sintonen were in the finish line cheering and congratulated me. Thanks everyone! It was unforgettable! Official finishing time: 19 hours 38 minutes 11,9 seconds. When I arrived to the cabin, I started to stiffen really hard, and I had real difficulties to stand up and I couldn't walk properly. I wasn't hungry at all. I just drank one recovery drink, one beer and water after that. I think this effort was even harder than my first 24-hour solo at Kangasala in 2006. I'm very happy. Full results here. 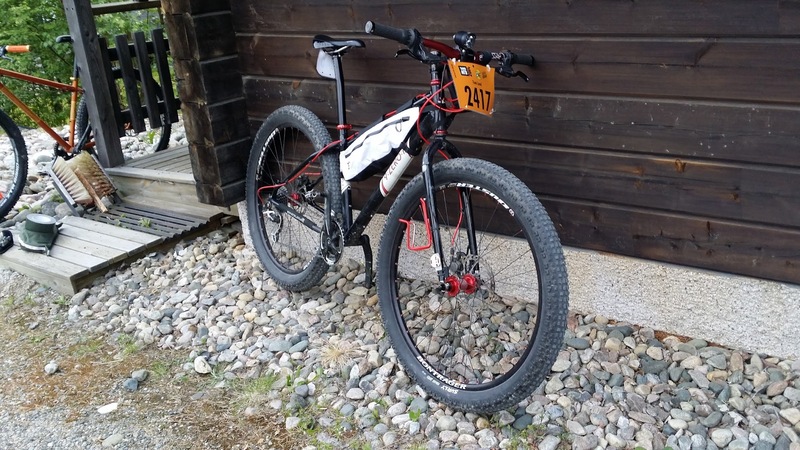 The bike, 'Arctic Machine 2', older 9:ZERO:7 with 29+ wheelset worked flawlessly and was just the right tool for the job. 29+ tires were clearly much better than ordinary 29er tires that I ran last year. Thanks again to all who have supported me, without you I could not have done this. All in all, this was great training for the ITI next March. Trip to Nilsiä included, I was awake 39 hours straight.